This is me, Edna Karwitha. I thank Matanya’s Hope and my dear sponsor for every provision you have made possible. Today is my sponsor’s birthday. Happy birthday Bonnie! 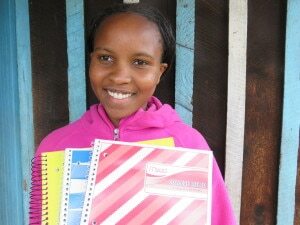 I am writing this blog to you, and to all of those who sponsor us students through Matanya’s Hope. Just as the name indicates Matanya’s Hope is a programme that has restored hope to many people when situations of life dictated otherwise. 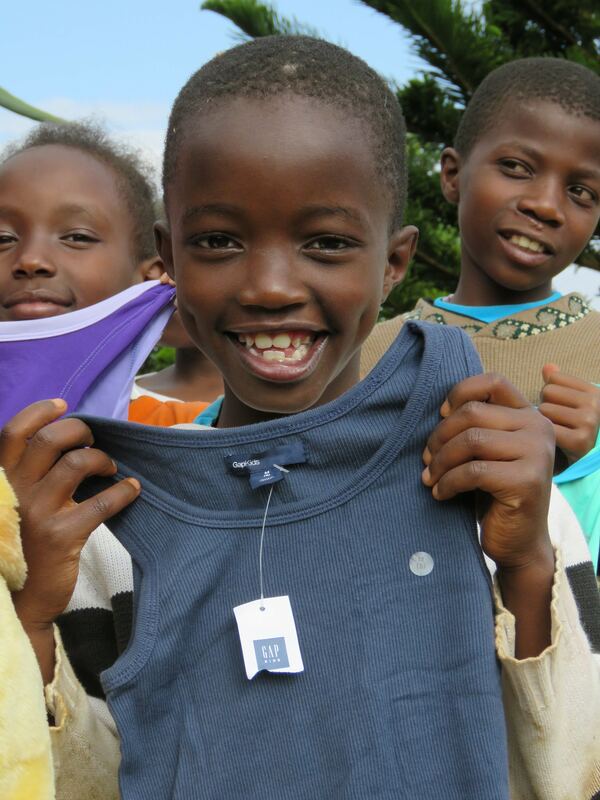 Matanya’s Hope restores love and comfort to many children who often lost all hope for life. I believe with all of my heart that our God who created us brought us to these obstacles we face, but I also believe that He brought us through them. To my fellow students, especially those who are still so much in need of a sponsor; do not lose hope. The answer is near. 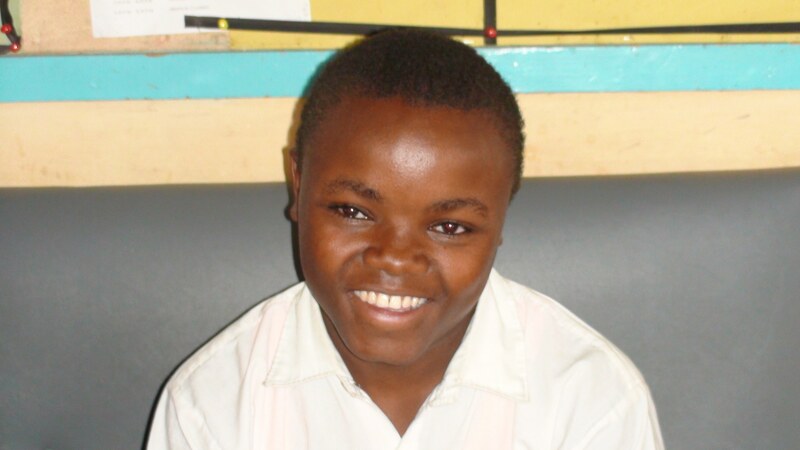 I am Edna Karwitha and I am one of the beneficiaries of the Matanya’s Hope sponsorship program in Kenya. I joined the programme in my primary school after I meet with our loving mum Michelle. Being a part of Matanya’s Hope is like being a part of this wonderful family where people come from all places and unite to do good! When I completed primary school, I scored very good grades and I was admitted to one of the best high schools in Kenya. Matanya’s Hope paid my school fees and bought my books and materials all though my secondary school years. I could never have remained in school without this help. In fact, most students are sent home for weeks at a time to collect fees. I was able to remain in class throughout. The support Matanya’s Hope offered, enabled me to continually work hard towards my goals. My sponsor, Bonnie, makes sure I have all of the supplies I need. I thank God for our mum Michelle. She travels every year to spend time with us, encourage us and visit us in school. She challenges us to work hard and do our best so as to be people of help in our societies in time to come. Michelle’s encouragement continually kept me motivated to achieve my goals. Matanya’s Hope has assisted me up to today. I am a third year university student pursuing a bachelor of commerce in accounting. I have been able to learn many virtues and important values by experiencing life in this advanced academic environment. I am continually empowered to work hard and to become a better person. One day, I pray that I will be in the position to selflessly invest in somebody else’s life just as Matanya’s Hope and my sponsor Bonnie have done for me. If I can do this, I know that I can also be a part of making a difference in our society. 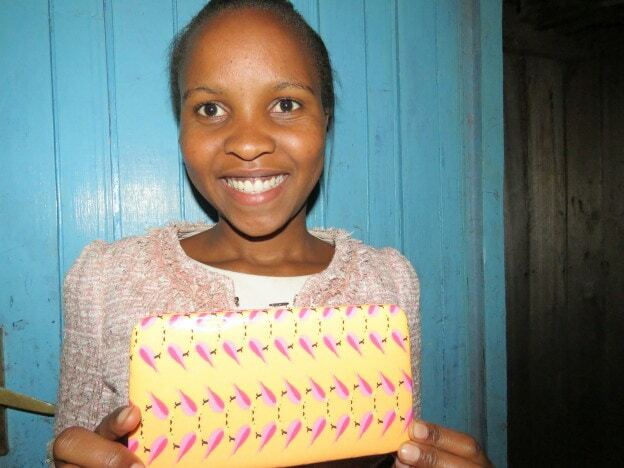 Matanya’s Hope teaches me the importance of sharing every day. I am grateful and I have learnt to share the little that God has entrusted to me. I also appreciate whatever people contribute towards my life out of their unselfish, personal sacrifice. Sponsorship has been full of so many rich experiences. Through my first sponsor, Alfonso, and now through my beautiful Bonnie, I can’t help but think of the miracles that have taken place in my life. Someone so far away … someone who never met me… has taken up the responsibility of loving me like a friend and parent. 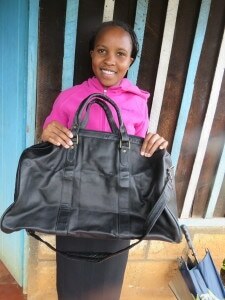 When I went to university, Matanya’s Hope even helped me with bags to carry my belongings. To all of you who donate, I want to thank you for helping so many of us who might never have known life outside of poverty. Without sponsorship my life would be filled with a sense of hopelessness because poverty just has a way of claiming so many dreams. My parents are often not able to help us meet our basic needs. This means that buying items even like soap or toothpaste can be great challenge for us. My sponsors and Matanya’s Hope have made sure I don’t suffer. They have taken my well-being as their responsibility. They help me (and hundreds like me) by making sure we have clothing, shoes, school supplies and items to support good hygiene. All of this love and care helps us to achieve our goals. 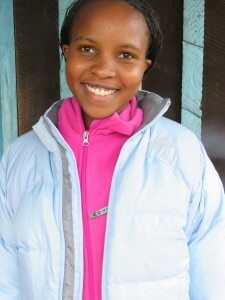 Matanya’s Hope and our precious sponsors find value in us no matter our situation. Thank you! For me, Matanya’s Hope has helped me understand that finding value in others and assisting someone achieve something that will change their lives and those related to them is one of the biggest achievement in the world. The impact Matanya’s Hope has had in my life will forever be of importance unto my family and to all generations that will arise after me. As I see it,it takes the love of God in our lives to do such things as Matanya’s Hope sponsors and donors do for us. There is always a better life outside of poverty. Sponsorship has made a difference in my family, my village and of course, in me! 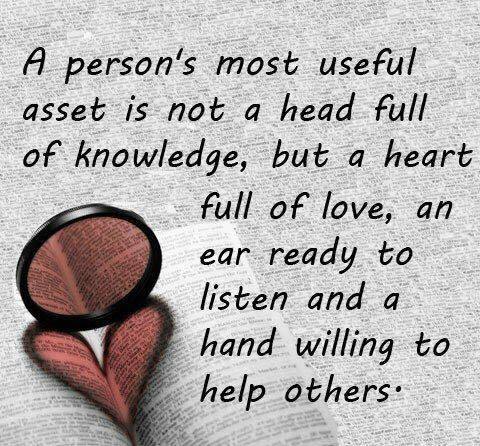 I will give back and will assist others get to the level that I am today. Thank you Matanya’s Hope for the light and the hope you brought in my life. This is me in a coat donated by Sue Wolf. Thank you Sue. I am honored to receive such a gift. To our dear loving mum, you have been so concerned and determined to see us grow to become great men and women in this nation. I assure each sponsor and donor that your efforts will not be in vain. We, your students, are growing in all areas of life to make the world a better place to live in. You have shown us how to walk on the path of hope and how to shine in all dimensions of Life. Much love and thank you. 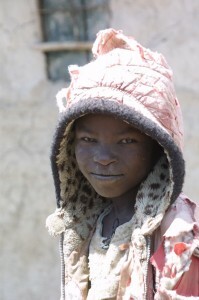 This entry was posted in The Children, To Our Sponsors and tagged Blankets Program, Bonnie Class, Donate, Donation, Education, Help, Hope, Kenya, Matanya's Hope, mission, Not for Profit, Poverty on June 24, 2016 by Michelle Stark. My name is Patrick. 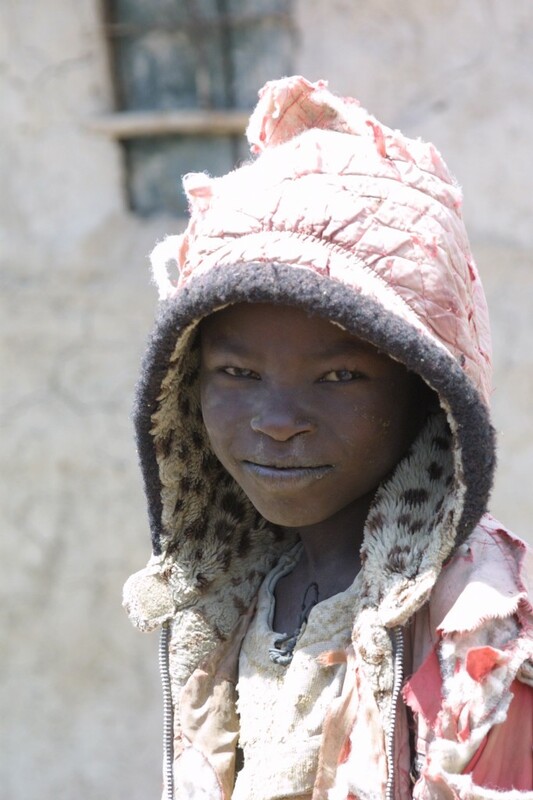 I know this might not be the first blog entry some of you are reading from me – I have written several, but this one is distinctive in that it reveals insights I could only gather after spending time serving with Matanya’s Hope. It is SPECIAL to me and I invite you to read and share with a friend. This would mean a lot to me. 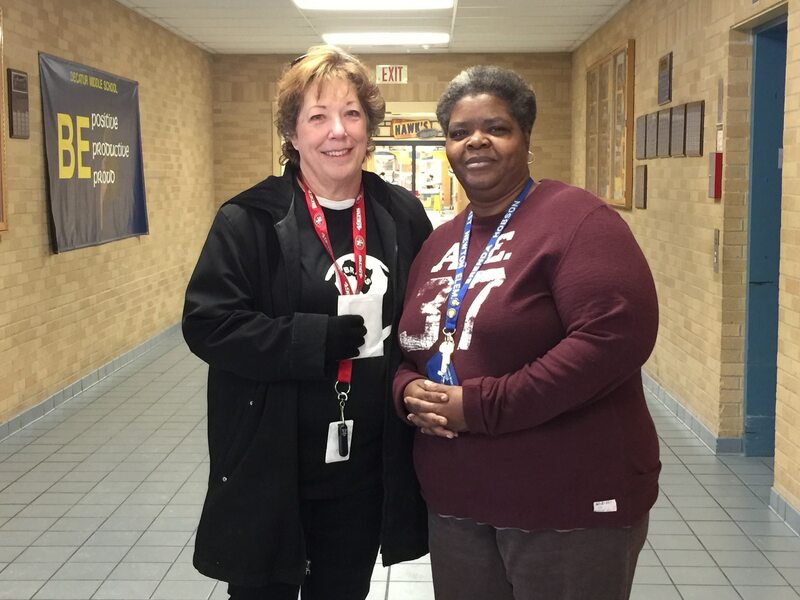 Two years ago, Michelle Stark visited me at school – I was still in High school. She asked me to describe MH in three words and I said, `MH is Hope’. Honestly, I meant it…….and I still do! But if someone asked me the question again today, I would have a totally different answer. To me today, MH is ‘DOING LIFE TOGETHER’. It is being a blessing to other peoples` lives – making the world a better place to live in, not just for ourselves, but for others. It is being sensitive enough and courageous enough to raise awareness so that we can become blessings to those same others that so many in this world close their eyes to – turn their backs on – ignore – and let rot in their own hunger, homelessness and hopelessness. Matanya’s Hope is different and I am different because of Matanya’s Hope. This photo of me was taken a few years ago. 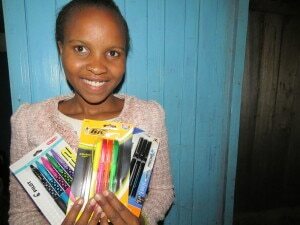 I was a high school student sponsored by Matanya’s Hope. Without this support, I can not imagine where my life might be today. 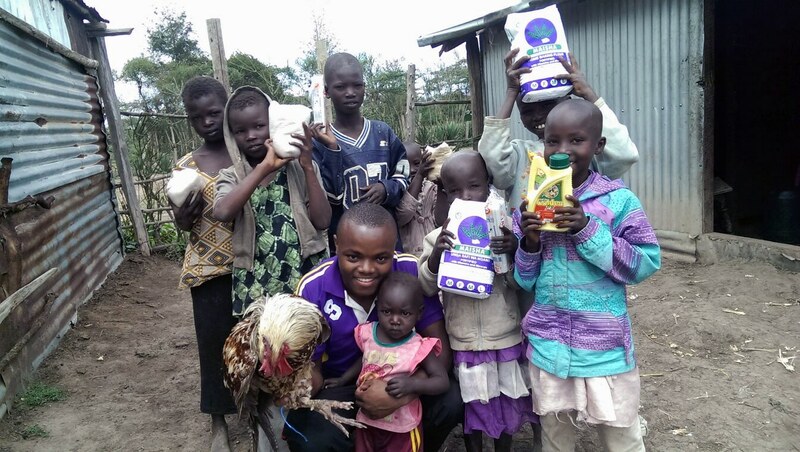 I spent my December holiday (I am now a first year economics student at TUK – Technical University of Nairobi) delivering donations….food stuffs, chickens, blankets, clothes and mattresses to needy families in Kenya. It was tiring. That I won’t lie, but as days went by, I got to like the idea of giving people a reason to smile. It was amazing to see a person’s eyes sparkle for one of the few times in their lives they may have felt relief, loved or valued by others. I can’t even describe how amazing it was to watch the recipients of MH gifts receive something even more than the gift itself; love. Its awesome. I want to do this over and over again – as far as God wants me to. Cucu (Grandmother to Matanay’s Hope student Jackline Gachohie) takes care of her 8 orphaned grandchildren. 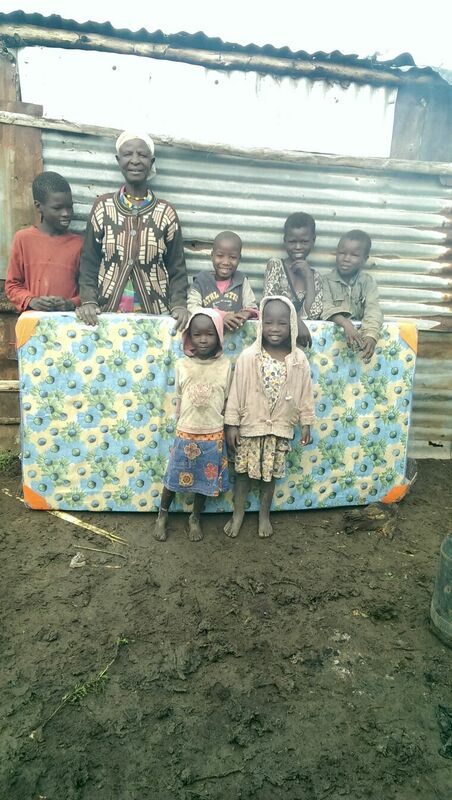 When Matanya’s Hope donated 2 mattresses to her several years ago, she gave them to her grandchildren while she continued to sleep on the floor. Your donations helped us bring the blessing of a new mattress to cucu this Christmas. There are so many scriptural references to God instructing us to love one another. Isaiah 58:7 is a perfect example. He instructs us to feed the hungry, house the homeless, clothe the naked…to help those in need. At times, we feel like we don’t have a lot to give out. This is when we think of life in terms of material possessions. But material possessions do not define life. There is more to the human experience than just material possessions………. Someone somewhere is dying for love….all they need is someone who can smile, laugh, hug or even pray with them. Be that person. Be that blessing. Be that miracle. If someone is hungry, share what you have. That’s what I have learned. One day it could be me – or my mother – or my child. I can’t even imagine the hurt I would feel if I watched people turn their backs on my own family. But each time we turn our own backs, we are shunning someone’s child, someone’s parent, someones sister or brother…and in some ways, even ourselves. And each time we help, we are helping to heal the world. I want to thank all of those who donated toward the Matanya’s Hope Christmas outreach. To those who donated to the chicken project, the mattress project, the blanket project and the food project, thank you for standing with us! I can`t mention all of you by name – you are so many………Michelle Stark – MY ANGEL, The entire MH family, The accounting firm: CJBS LLC, Kelly and Dave Golding, Kaitlin and Bill Bell……gosh, I want to mention every one. Thank you so much for being a blessing – a miracle. 8 orphaned children live with their one widowed grandmother. Food has been a constant issue in their lives, but today, Matanya’s Hope donors make more than a Christmas meal possible! Thank you to Kelly and Dave Golding who made this food possible as a Christmas gift honoring their daughter Jackline! Thank you for making love happen. This entry was posted in Matanya's Hope, Partners with Matanya's Hope, Programs to Help, To Our Sponsors, Uncategorized and tagged Blankets Program, Christmas, Donate, Donation, East Africa, Education, Help, Holiday, Hope, Kenya, Matanya's Hope, mission, Not for Profit, Poverty on January 13, 2016 by Michelle Stark. Thank you for visiting my Blog – I am hoping we can make a difference together one child at time. To learn about my Mitzvah Project please read below. If you are interested in helping out and contributing you can make a donation – feel free to contact me or my parents with any questions. I invite you to watch the video located on this blog, just after my signature. Here you will see the story of this family unfold as I explain their condition and need for the latrine. 1. SCROLL TO THE TOP OF THE PAGE AND LOOK ON THE UPPER RIGHT CORNER. 2. CLICK THE “DONATE” BUTTON. It was amazing to see how happy these children were to get a simple gift of an undershirt or some crayons.Last year, my sister Madison and I contributed to a wonderful charity for orphaned and deeply impoverished children in Kenya called Matanya’s Hope. 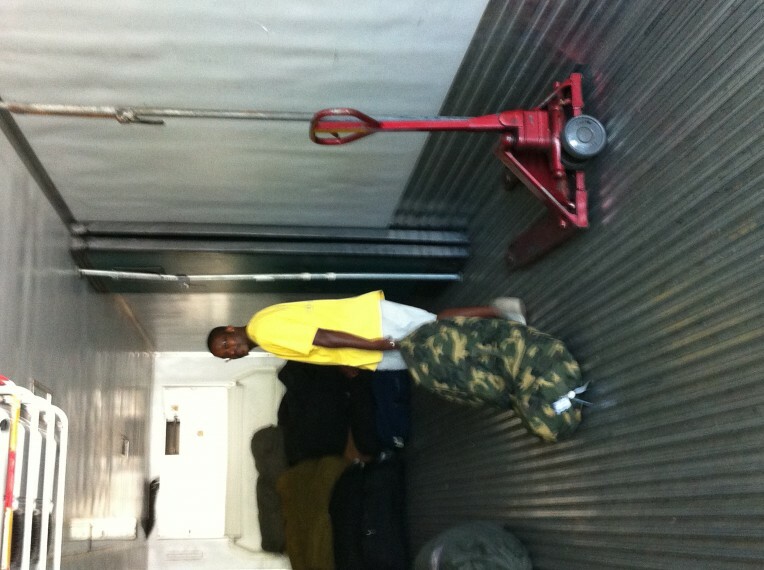 We donated much needed clothing and essentials for these less fortunate children. 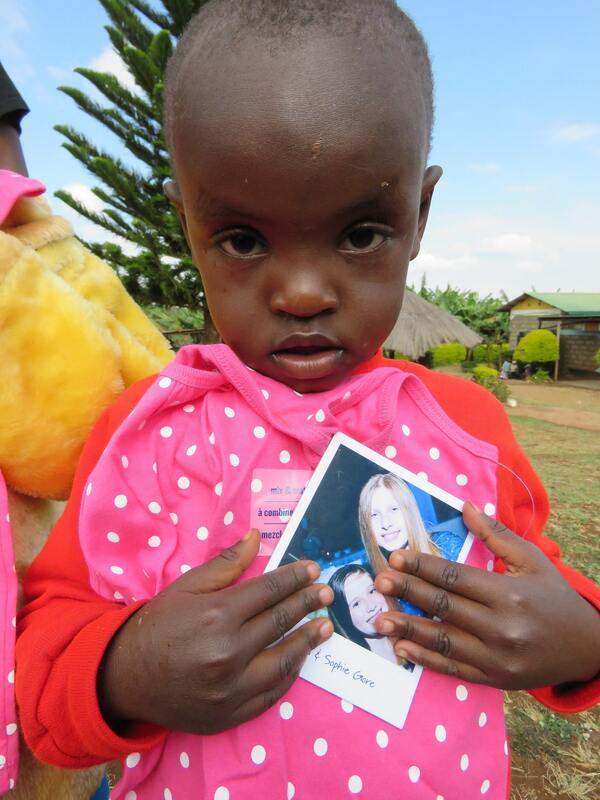 This little orphaned girl is holding our picture – and behind that is a pair of pajamas we donated for her to wear. 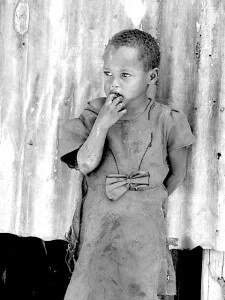 This little boy is also an orphan. 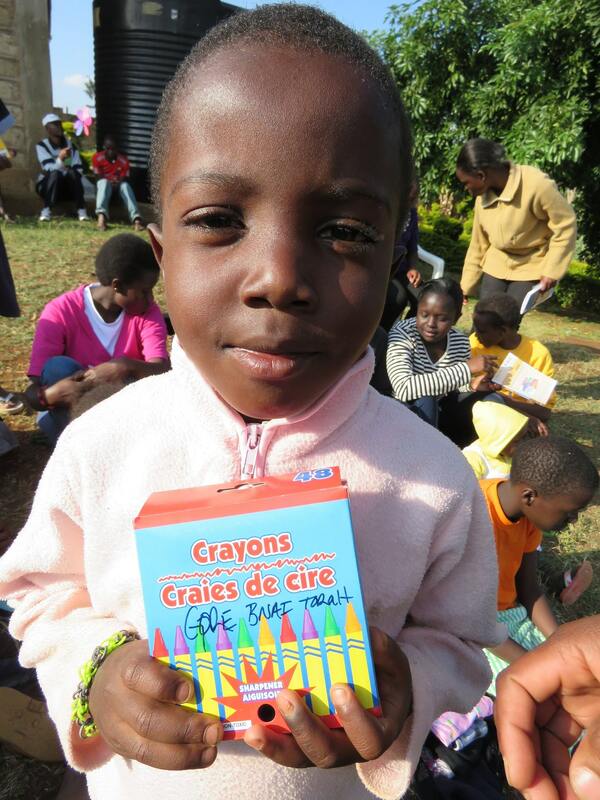 He was happy to get one of the many boxes of crayons our family sent for the children. It was wonderful and so sad at the same time to view photos of each of our donations as they were held in the hands of these children. 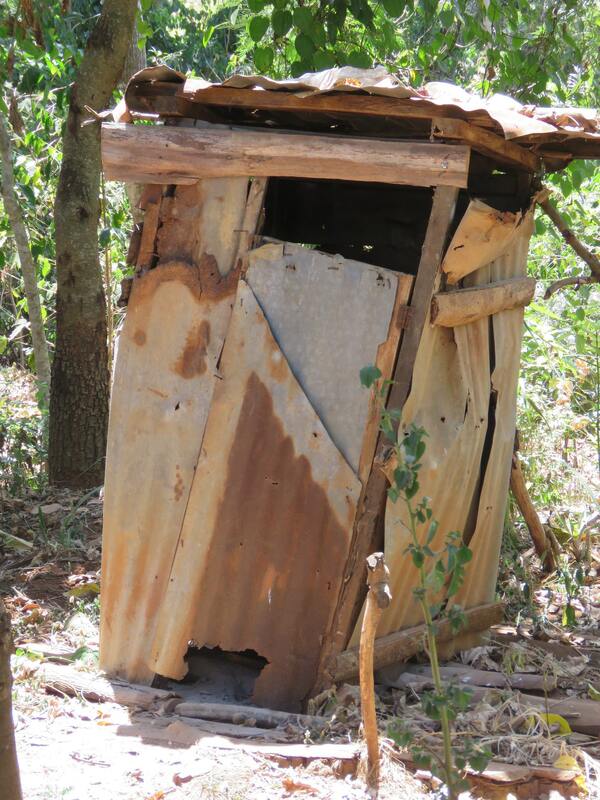 I heard many of their stories, and after one in particular: The Story of Pamela, I was determined to raise enough money to build a safe latrine (outdoor toilet) for her family of 2 orphaned girls and their two elderly and jobless grandparents. This is Pamela; she is in 5th grade. She is an orphan. People in the impoverished community contributed money until they could make her a dress. 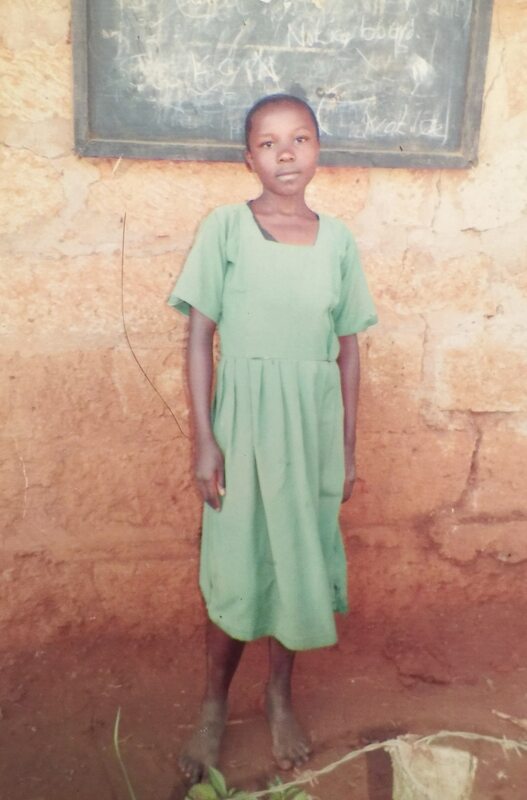 Thanks to my Synagogue, Pamela is sponsored and can now go to school. Currently, their latrine is made of rotted, unstable wood and poses a potential lethal risk of someone falling through into the pit below. 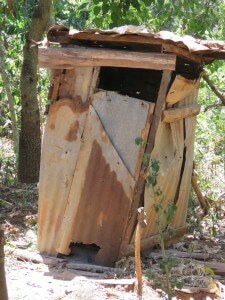 The cost of this new latrine is approximately $1,500. It will change the world for this family and will send them the message that someone, somewhere hears their story and cares enough to help. Let’s not close our eyes to this family in need just because we can’t see them next door. 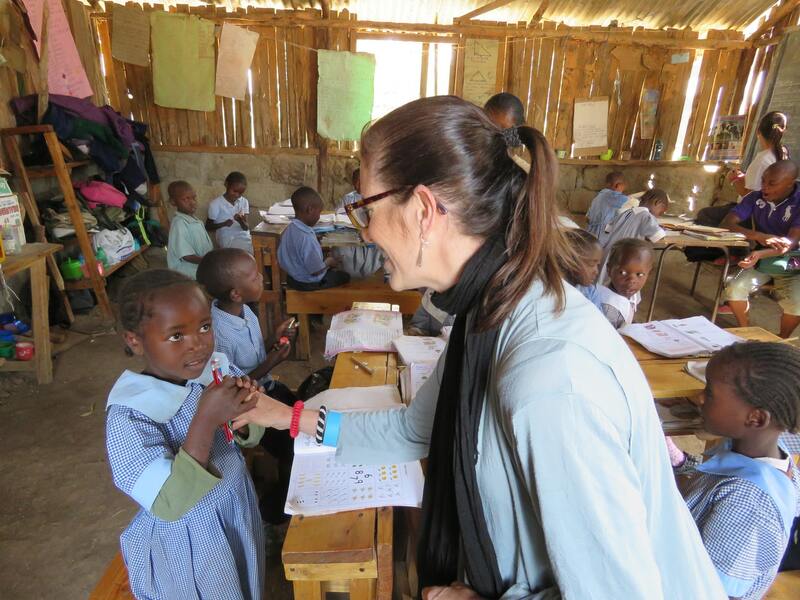 Michelle, founder of Matanya’s hope, is pictured below handing out supplies to needy children in a rural Kenyan day school. She is the one who will go to Kenya and oversee the building of Pamela’s new latrine. This entry was posted in Events, Partners with Matanya's Hope, Programs to Help and tagged Donate, Help, Kenya, Matanya's Hope, mission, mitzvah project, Not for Profit, sophie's blog on November 11, 2015 by Michelle Stark. She sleeps on a dirt floor. She has nothing but shredded remnants of clothes to cover herself with. Oh how I would love these things! But today, I am especially praying for a blanket. I sleep on the dirt floor. and I shiver a lot. During rains, the floor becomes wet. Rain enters our mud hut. I don’t sleep on those wet nights. but I get so tired, sometimes I sleep anyway. My list is long, I guess. because I learned you make blankets for children like me. 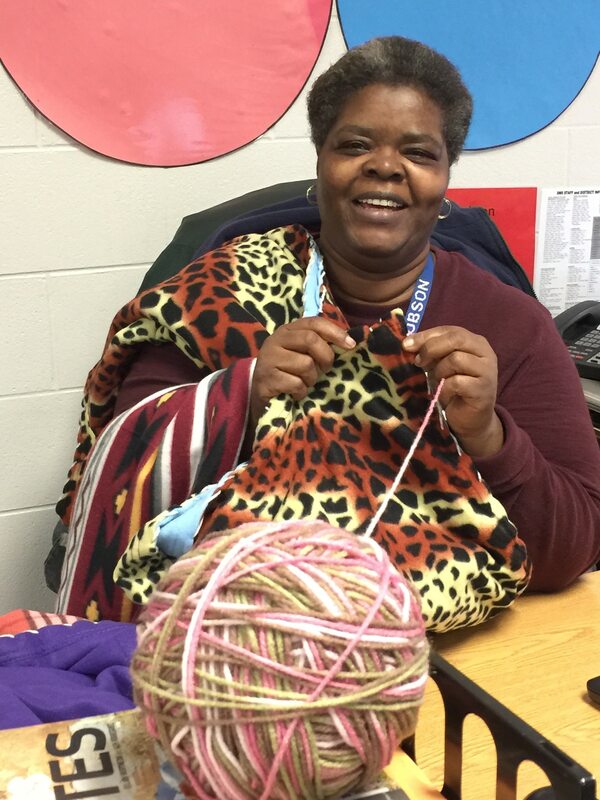 A blanket made with love can warm the heart of a child in need. 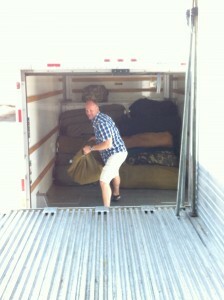 Please DONATE today and help Matanya’s Hope transport these blankets to Kenya. Thank you for helping us make a difference for children who are counting on us to hear their needs. Much thanks goes out to everyone who made and donated blankets to Matanya’s Hope. This entry was posted in Partners with Matanya's Hope, PRE MISSION and tagged Blankets Program, Donate, Hamilton Southeastern High School, Kenya, Matanya's Hope on June 11, 2015 by Michelle Stark. 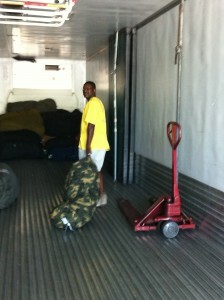 We are on our way – Bags Ready to GO! 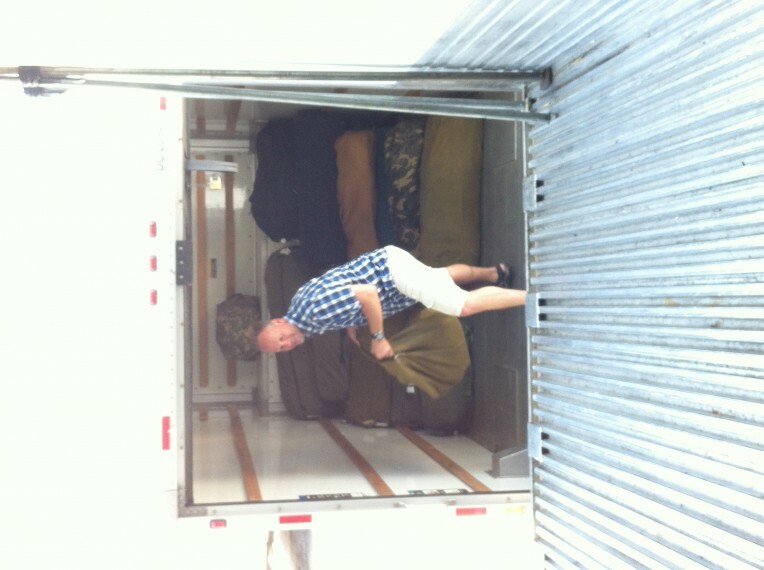 Many thanks to my Journey Family and Friends who helped make the transport of almost 70 fifty pound bags from my living room to a truck possible. Hats off to Nicholas, Pastor Dave, Caleb, Joshua, and Aaron for their endurance and incredible strength. Randle and Alex, you guys and Pastor Dave helped us “bring it home!” And continued praises and thanks to my mom and son, Ann, Shana, Tina, Jeannette, Debbie, Ali and Leslie and Howard who helped turn this mission to a reality. To all of you who stepped forward – thank you for your hearts and vision! Two months ago we were $16,000 shy of making this mission a reality. Today – we seek $225 to seal the deal… We could not have done this alone! Stay tuned… pics and videos to come from Kenya! This entry was posted in Matanya's Hope and tagged East Africa, Education, Help, Hope, Kenya, Matanya's Hope, mission, Not for Profit, Poverty on June 7, 2014 by Michelle Stark.